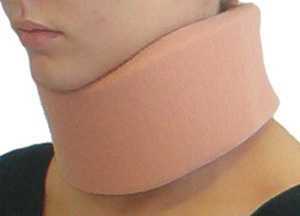 Cervical/neck collars are commonly used by patients who have had a surgical intervention of the cervical spine, to immobilise the neck. It is also used for the treatment of neck pain, caused by acute trauma or chronic pain. After a whiplash injury, the neck collar can be used for both immobilisation and to reduce pain, although the value of the collar over early active mobilisations is questioned as early mobilisations can give a greater improvement in cervical range of motion and in the reduction of pain following a whiplash injury. The main goal of neck collars is to prevent or minimise motion in the cervical spine. It also keeps the head in a comfortable gravity aligned position, maintaining normal cervical lordosis. Even though the term "Cervical Collar" has been widely used, the standardised and universally accepted term is now cervical orthosis. The name should be given depending on the parts of the body the orthotic device is supporting, such as cervical orthosis, head cervical orthosis or cervico-thoracic orthosis for example. Soft collars are made out of felt. They are cut to mould around the neck and jaw of the patient, the size being adjusted to the patient. These collars do not completely immobilise the neck however, they restrict motion and are a kinesthetic reminder for the patient to reduce neck movement. Since the collar is under the chin and supports the chin, it minimises muscle contraction needed against the gravity forces to keep the head in a normal position .This type of collar does not truly immobilise the neck, it only limits flexion and extension in the end phase. These collars are a close fit around the neck restricts perspiration. The rigid collars are a similar design to the soft collars, but are constructed out of plexiglass. They are easily applied and are easy to keep clean, an advantage of the plastic collar. 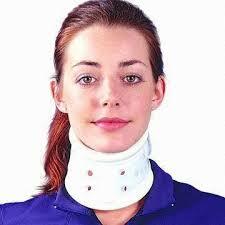 This type of collar is also supplied in different sizes to fit the patient. These collars restrict motion in flexion and extension. They not only support the chin but also the occiput, reducing active extension, especially in the end phase. A drawback of the rigid collars is that they potentially can cause venous outflow obstruction, which may elevate intracranial pressure. If there is a clear evidence of an increased intracranial pressure, the collar should be removed or re-positioned. The most frequently prescribed are the Aspen, Malibu, Miami J, and Philadelphia collars. All these can be used with additional chest and head extension pieces to increase stability. Cervical collars are incorporated into rigid braces that constrain the head and chest together. Examples include the Sterno-Occipital Mandibular Immobilization Device (SOMI), Lerman Minerva and Yale types. Recommendation is that a collar should be worn constantly for one week only for the reason of pain relief. After that the use of the collar should be gradually decreased. If the collar is worn for a longer period, it could have several negative effects such as: soft tissue contractures, muscular atrophy and deconditioning, loss of proprioception, thickening of subscapular tissues and coordination, but also psychological dependence. Several studies raise doubt however of the efficacy of the neck collar compared to early mobilisations. 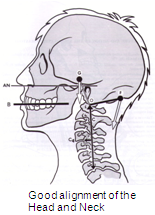 They both reduce the pain, but early mobilisations show a greater improvement in cervical range of motion. Pennie and Agambar however suggest that there is no difference between the two interventions. When different types of cervical collar are compared with respect to mechanical stability (both actively and passively), all collars restrict motion to some extent. In order of least restrictive to most restrictive are: soft collar, Philadelphia collar, SOMI. although, the differences are not large. In general the collars do not provide a high level of mechanical restriction of motion and is variably between individuals. The soft and rigid collar show no significant differences in movement for the most daily activities. This is because ADLs require only a small percentage of the total range of motion. Both collars can be used for people who are in less pain, but who need the collar to immobilise the neck and for a sense of security. In this case, the collars act primarily as proprioceptive guides to regulate the movement of the cervical spine rather than as a restraint to physically impede motion. Cervical collar use and rest or physiotherapy and home exercises were compared with a 'wait and see' policy for patients with cervical radiculopathy over a period of 6 weeks. The cervical collar was semi-hard, comfortable and in six different sizes. Patients had to wear it for the entire day during the first 3 weeks while also taking as much rest as possible. During the 3 last weeks, they had to decrease the time wearing the collar. After 6 weeks they ceased wearing it. Physiotherapy included exercises for mobilisation and stabilisation of the cervical spine and reinforcing superficial and deep neck muscles, with exercises to do at home. The 'wait and see' patients were asked to continue daily activities as much as possible. Results show that arm and neck pain were significantly reduced with the collar and physiotherapy in comparison to the 'wait and see' approach. The results for the neck disability index show a significantly greater improvement for the collar, while physiotherapy showed the same pattern, but it wasn’t significant compared to the wait and see policy. The cervical collar and physiotherapy decrease foraminal compression and inflammation of the nerve root by immobilisation, reducing arm and neck pain. Physiotherapy aims to regain range of motion and strength of the neck musculature, so that musculoskeletal problems are avoided. The reason for pain reduction is still unclear, however. It is concluded that a semi-hard cervical collar and rest, or physiotherapy and home exercises are effective for the short term (6 weeks) reduction in pain for patients with cervical radiculopathy, in comparison with a 'wait and see' approach. Primary outcome measures were VAS for neck and arm pain and the neck disability index. Even though cervical orthoses are effective for short term pain relief, they are not an alternative to physiotherapy treatment. However, if used appropriately, cervical orthoses can be an effective adjunct to a patient's treatment program. ↑ 1.0 1.1 Mealy K. et al. Early mobilizations of acute whiplash injury. British Medical Journal. 1986; volume 292: 656-666. ↑ Colachis SC et al. Cervical spine motion in normal women: radiographic study of effect of cervical collars. Archives of physical medicine and rehabilitation. 1973; 58(7): 865-871. ↑ Fisher SV et al. Cervical orthoses effect on cervical spine motion: roentgenographic and goniometric method of study. Archives of physical medicine and rehabilitation. 1977; 58(3): 109-115. ↑ Johnson RM et al. Cervical orthoses. A study comparing their effectiveness in restricting cervical motion in normal subjects. Journal of Bone and Joint Surgery. 1977; 59(3): 1185-1188. ↑ 5.0 5.1 5.2 Sandler AJ. The effectiveness of various cervical orthoses: an in vivo comparison of the mechanical stability provided by several widely used models. Spine. 1996; 21(14): 1624-1629. ↑ Davies G et al. The effect of a rigid collar on intracranial pressure. Injury. 1996; 27(9): 647-649. ↑ Mobbs RJ et al. Effect of cervical hard collar on intracranial pressure after head injury. ANZ Journal of surgery. 2002; 72: 389-391. ↑ Ho A MH. et al. Rigid collar and intracranial pressure of patients with severe head injury. Journal of Trauma. 2002; 53: 1185-1188. ↑ Jasper et al. (2018). Clinical practice guideline for physical therapy assessment and treatment in patients with nonspecific neck pain. Physical Therapy. Vol 98; 3. 162 - 172. ↑ Lieberman JS: Cervical soft tissue injuries and cervical disc disease. In Principles of Physical Medicine and Rehabilitation in the Musculoskeletal Diseases, Grune, New York, 1986: 263-286. ↑ McKinney. Early mobilization and outcome in acute sprains of the neck. British Medical Journal. 1989; 299: 1006-1008. ↑ Pennie and Agambar. Whiplash injuries. A trial of early management. Journal of Bone and Joint Surgery. 1990; 72B: 277-279. ↑ Kuijper B et al. Cervical collar or physiotherapy versus wait and see policy for recent onset cervical radiculopathy : randomised trial. BMJ. 2009;1-7.